Eric Quizon (left) recalled the time GMA-7 presented Dolphy with an offer to do a show on the Kapuso Network. Atty. 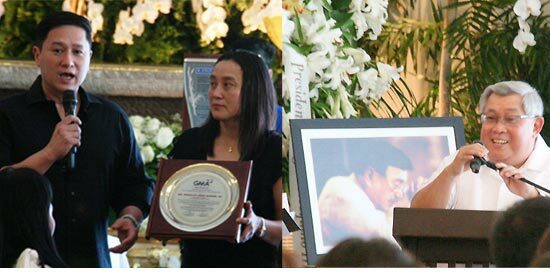 Felipe L. Gozon, chairman and CEO of GMA Network (right), presented the Quizon Family with a posthumous plaque for Dolphy's achievements. GMA-7 paid tribute to the late Comedy King Dolphy through a necrological service last Saturday, July 14, at the Heritage Park, Taguig, one day before the he was finally laid to rest on Sunday. “Ang pakikiramay at pagdadalamhati sampu ng pasasalamat na pinamamalas ngayon di lamang ng mga taong nakapila sa labas, ng mga taong nandito sa loob, kundi ng buong sambayanang Pilipino, ay isang natatanging pagpapahalagang higit pa sa anumang award na nararapat ibigay kay Dolphy,” Atty. Gozon said. Actor-director Eric Quizon accepted the plaque in behalf of his family, and expressed their appreciation for the Kapuso Network. He also shared how his father almost became a Kapuso. Kapuso talents, who once had the opportunity to work with and get to know Dolphy, also shared their fondest memories of the comedy icon. Veteran actress Nova Villa and actress-turned-politician Maybelline dela Cruz tearfully recalled their experiences when they worked with him on a sitcom for 17 years. Chroreographer Geleen Eugenio shared how Dolphy played a big role in her successful career. Among those who rendered song numbers during the memorial service for the King of Comedy were Ogie Alcasid, Regine Velasquez, Frencheska Farr, and Mark Bautista. Other Kapuso stars who attended were Richard Gutierrez, Geoff Eigenmann, TJ Trinidad, Bearwin Meily, Chariz Solomon, Maey, Betong, and German Moreno, who is one of Dophy’s friends in the industry. Carla Abellana hosted the tribute, while the mass was officiated by Fr. Eric Santos. Also present were GMA Network officers: 24 Oras news anchor and consultant for Radio Operations and President for RGMA Network, Inc. Mike C. Enriquez; OIC for Entertainment Lilybeth G. Rasonable; Vice President for Entertainment Marivin T. Arayata; Asst. Vice President for Entertainment Redgie A. Magno; Asst. Vice President for Talk, Game and Reality Janine P. Nacar; Asst. Vice President for Corporate Communications Angel J. Cruz; Asst. Vice President for Talent Development and Management Simoun S. Ferrer; and Atty. Gozon’s wife, Mrs. Teresita Gozon.